182 rooms and suites surrounded by a flourishing garden, excellent cuisine and exquisite service for a dream vacation. The hotel may require approval to debit credit card to prepay. 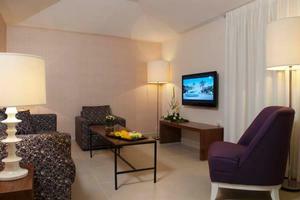 All rooms are equipped with: Refrigerator, Cable TV, telephone, bathroom and full air conditioning. Astral Village is located On the northern beach of Eilat just by the marina and the Peace Lagoon.